What you are looking at is Stephan's Quintet. Four of the five galaxies in this image are colliding. 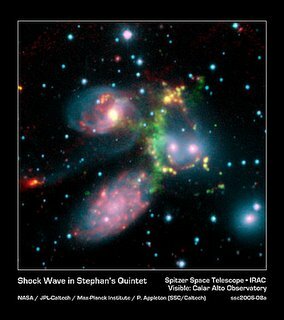 The green arc in the center of the image is actually one of the largest shock waves ever seen- it's a shock wave bigger than our own galaxy! It is being produced by one galaxy falling toward another at over a million miles per hour.